Sir Nick Parker left the Army in May 2013 after a 40 year career. Since leaving, he has conducted a review into the senior structure of the Police Service in England and Wales and has mentored senior executives in the extraction, transport, human resources, elite sport and legal sectors. He has led seminars in the Changing Character of War programme at Pembroke College Oxford, and is working with The Partnering Initiative on a programme to improve Global Human Development. John has served in both the RAF and Army. Having been responsible for fixed and rotary wing flying training, RAF recruiting, individual ab-initio and specialist ground training and oversight of the Air Cadet Organisation, he joined AgustaWestland as Senior Vice President Training in 2007. John became Managing Director of AgustaWestland Ltd in August 2015. John relinquished his functional support responsibilities in October 2016 and retired as Managing Director, Leonardo Helicopters UK, in January 2018. Andrew left the Army in 2009 leaving as a Brigadier after a full career. Having been responsible for Army recruiting for his last 4 years, on leaving he joined Kenexa, a specialist HR science and technology company, where he was responsible for the company's government business. IBM acquired Kenexa in 2012. Andrew left IBM in 2014 to set up SaluteMyJob. Andrew sits on the Boards of Corporate America Supports You, the Military Spouse Corporate Career Network in the US and on the Advisory Board of Recruit for Spouses in the UK. Aine has worked in the HRO and Recruitment Industry since 1998, first for Lansdowne and then Arinso and NorthgateArinso. Holding Senior Manager and Director positions, implementing and overseeing outsourced services to some of the UK's largest employers. Her specialities include service design and operation, client relations and a core focus on great service through customer and candidate experience. Francine served for 13 years in the Royal Air Force as a Photographer and Photographic Manager, working in England, Germany, Poland and Afghanistan during this time. She specialised as a Recruitment Consultant for two years in different Armed Forces Careers Offices. Francine has brought these skills to SaluteMyJob to help ex-military candidates find sustainable and satisfying employment. 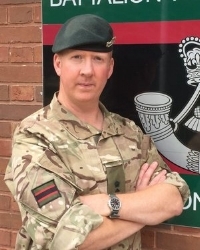 Jon served in the Regular Forces for 16 years as an infantry officer before leaving for Reserve Service, where he is Commanding Officer of 6 Rifles. Jon set up a commercial recruitment project to help businesses understand and access the talent leaving the Armed Forces, with a focus on supporting Riflemen. He has continued to work in recruitment, with a focus on developing client relationships, for the last 5 years. Jon has also worked as the Operation’s Director for a national charity. Tamsin set up FSBD, an expert business development and sales support company after 18 years’ experience in sales management, marketing and business development, in both national and international roles. Under FSBD Ltd, Tamsin now freelances in various roles in business development, interim management, sales and marketing. Working with SMJ as a contractor, Tamsin uses her vast skills and experience to focus on business development and generating leads with new clients to offer our tailored veteran consultancy services. Sam is an accomplished marketing and communications manager with experience spanning new media, broadcast, publishing and the voluntary sector. Sam joined SaluteMyJob after working as a Communications Officer at Wiltshire Wildlife Trust and has brought an extensive working knowledge of online and offline marketing techniques to the team. Faye is a former journalist, gaining experience in two busy newsrooms in Devon and the Lake District and is in charge of writing content for SMJ’s News and Best Practice blog. Faye is a military spouse and is a keen fundraiser for the Royal Marines Charity, with her most recent challenge being a 103-mile yomp to raise money for the charity. Ben is a best-selling author, accomplished keynote speaker and sought-after leadership mentor who has worked with senior leadership teams in the U.K, US and Australia. He completed two tours of duty in Iraq as a Captain in the British Army, then moved into business as Global Head of HR, World Challenge, later part of Tui Travel and followed this with a period in the Tesco Leadership Academy.